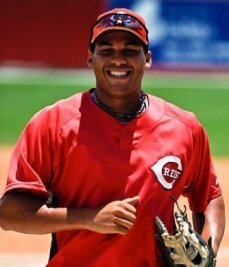 During last year’s spring training, I remember hearing about a prospect in the Cincinnati Reds’ system who grew up in Germany and didn’t play baseball until he was 16. He was raw, but he’s still in the system and has improved. Reds manager Dusty Baker has raved about Donald Lutz this spring. Lutz, or “Big Lutz,” as Baker calls him, has a lot of pop in his bat. Lutz, unlike his 30 Rock namesake, is tall and muscular, standing at 6 feet, 3 inches and weighing 250 pounds. So far this Spring, he’s got a .353 average, an on base percentage of .389, and a slugging percentage of .588. This is all in sizes so small it’s hardly a sample, but he does also have a home run and 5 RBI. He could be a special player in the next year or two. This year, though, he’s likely to start in Pensacola on the AA team. There he’ll continue to work on the move from first base to the outfield. Because even though he’s 2 or 3 years away from the majors, the Reds have a first baseman for quite some time who isn’t moving for anyone. The Reds were off yesterday, leaving Reds fans everywhere with very little to worry relentlessly about. Just kidding, there’s plenty of stuff to worry about. As if to make up for yesterday, the Reds are doing double-duty today. Half the team will be stay home to host the Cubs. Tony Cingrani will start for the Reds. Meanwhile, the rest will be head to Camelback Ranch to take on the Dodgers. Bronson Arroyo will be the one to start that game. Both games begin at 9:05 p.m. ET. 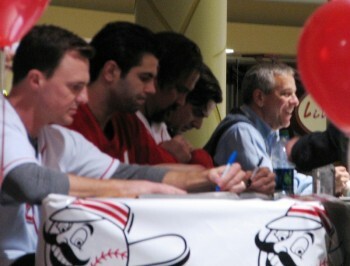 Jay Bruce, Ryan Lamarre, Corky Miller, Phil Castellini, and Thom Brennaman on the dais, signing merchandise for fans. I got this email from the Reds this morning, and thought you might like to know about your chance to talk baseball operations. It’s perfect for all you baseball fan MBAs out there! Reds Chief Operating Officer Phil Castellini will be chatting LIVE with fans today at 3 p.m. ET at reds.com. Fans will have the chance to talk with Phil about some of the club’s new business initiatives for 2013, including improvements to the ballpark, dynamic pricing on tickets and much more. Fans can login to the chat starting at noon ET on reds.com and begin submitting their questions. To participate in the chat, fans will need an MLB.com account. Click here for more information and to take part in today’s chat! According to Doc’s Sports Network, Vegas favors the Reds to win the NLC, giving them 5/7 odds.